GERSHWIN, GEORGE. (1898-1937). 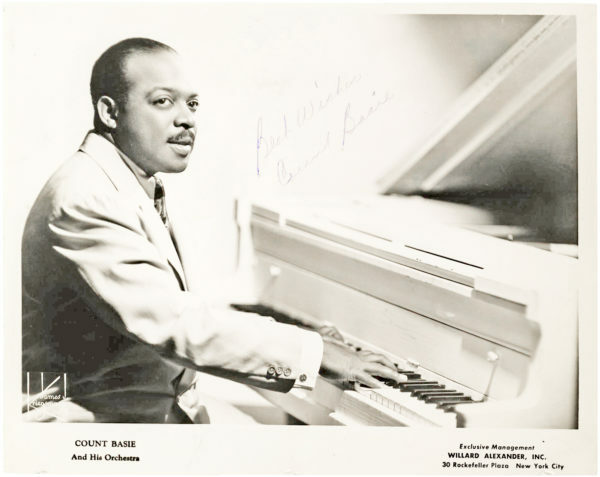 Signed first edition of the piano vocal score of America’s greatest opera, Porgy and Bess. (“George Gershwin”). 559pp. Folio. (Gershwin Publishing Corp., New York, 1935). Inscribed on the title page to Gershwin’s first biographer ISAAC GOLDBERG (1887-1938) with the additional signatures of his brother, lyricist IRA GERSHWIN (1896-1983); author and librettist DU BOSE HEYWARD (1885-1940); director ROUBEN MAMOULIAN (1897-1987); and conductor ALEXANDER SMALLENS (1889-1972). Each collaborator has added their signature beneath their printed name. 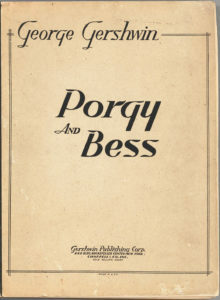 George Gershwin read Heyward’s novel, Porgy, in the summer of 1926, and immediately wrote him suggesting a collaboration on an operatic version. 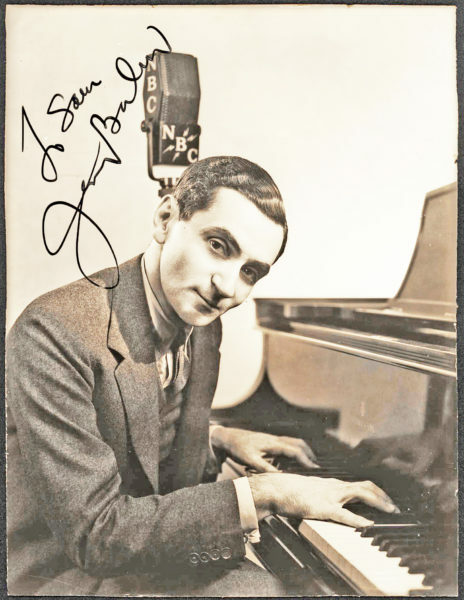 Informed that a stage adaptation by The Theatre Guild was already underway, Gershwin set aside his plans, never losing hope, however, that such a venture could someday be realized. The Guild’s acclaimed production of Porgy, also directed by Rouben Mamoulian, premiered on October 10, 1927. 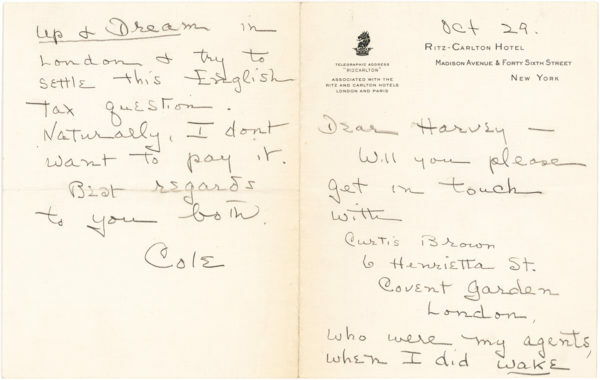 Interest in the play remained sufficiently high so that when Gershwin contacted Heyward again in 1932, he met with a favorable response. Soon George, Ira, and DuBose commenced work on a musical setting of Porgy. 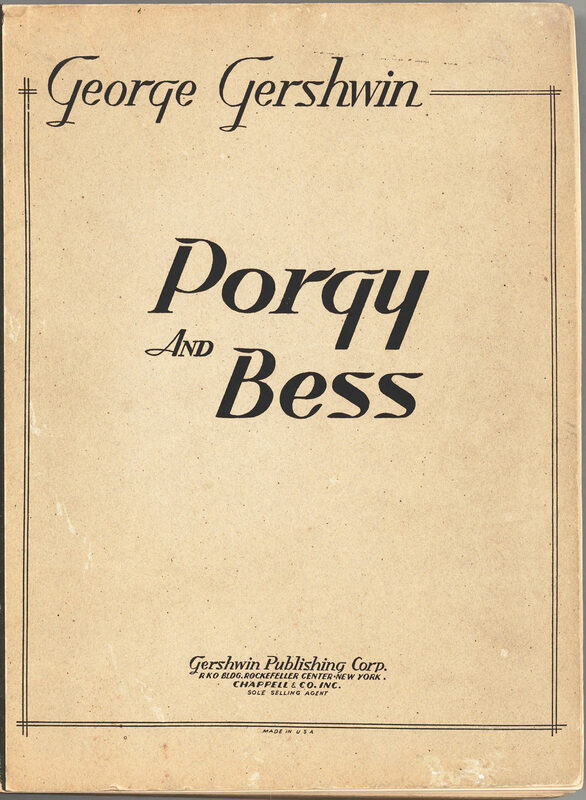 Three years later, on October 10, 1935, and exactly eight years after its stage debut, Porgy and Bess opened in New York. It remains, to this day, an American classic. Before starting on the score and orchestration – whose unique style included popular music, the jazz rhythms of Harlem where Gershwin spent his youth, and the traditional operatic aria – Gershwin spent a summer in South Carolina to familiarize himself with the customs and music of African-Americans from that region. In 1935, The Theatre Guild approached Mamoulian to direct Gershwin’s production. Although he had met Gershwin on only one other occasion, Mamoulian immediately accepted the offer, without even hearing a single note of the score. 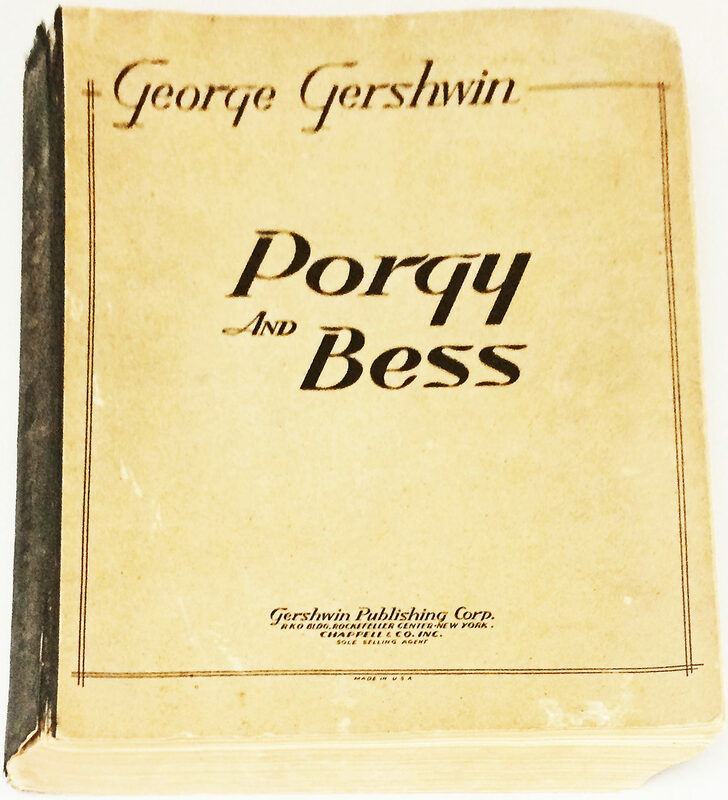 Upon listening to Gershwin’s melodies, “Mamoulian was caught at once by the color and provocative rhythm of the music,” (The Life and Times of Porgy and Bess: The Story of an American Classic, Alpert). Opening on October 10, 1935 at the Alvin Theatre in New York, the production suffered no lack of praise; however, music critics questioned whether Gershwin had created an opera in the strictest sense. Stylistic criticisms followed; nonetheless, the consensus – which continues to this day – was that Gershwin had created a “compellingly dramatic” production, and that Mamoulian pulled off “one of the most notable feats in virtuous direction our modern theatre has ever seen,” (ibid.). 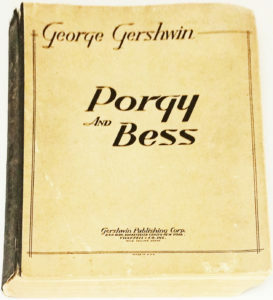 About his own work, Gershwin maintained that “Porgy and Bess is a folk tale… therefore I wrote all my own spirituals and folksongs,” which brought to the operatic convention “elements that have never before appeared in opera… the humor, the superstition, the religious fervor, the dancing, and the irrepressible high spirits” of southern African-American culture, (ibid.). More than sixty years later, Porgy and Bess remains the quintessential American opera. Goldberg, a music critic, was founder and editor of the news magazine Panorama. Among his many books and articles is the 1931 book George Gershwin: A Study in American Music, as well as biographies of H.L. Mencken, Havelock Ellis, W.S. Gilbert, and Arthur Sullivan. Goldberg also translated Sholem Asch’s play The God of Vengeance, currently the subject of the Broadway hit Indecent. Original gray printed wrappers with cloth-backed spine. Spine is cocked with a slight tear at top of upper joint. Normal foxing and wear. In very good condition. 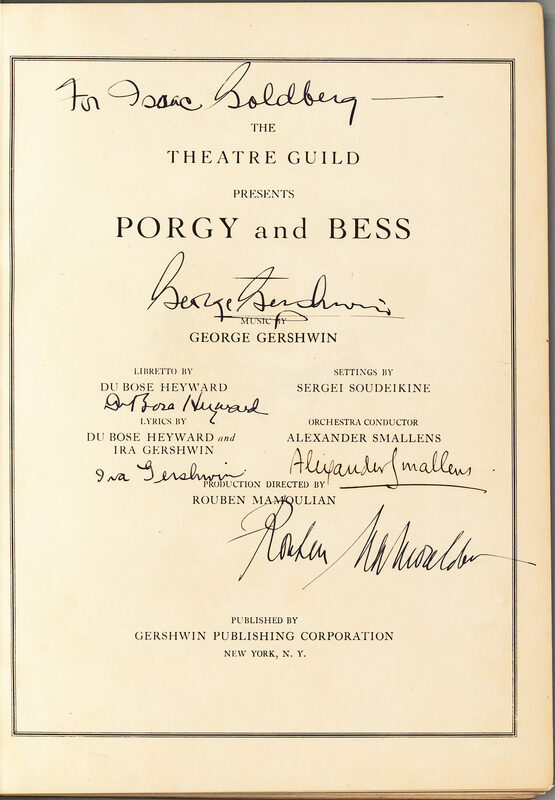 Although the signed, limited edition of Porgy and Bess is quite common, this is the only copy of the first edition signed by all five contributors we have ever seen offered for sale. “Bess, you is my woman now and forever.